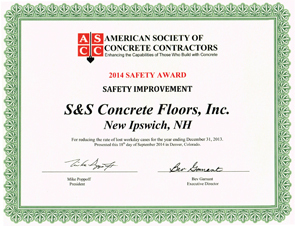 (September 2014 - Denver, CO) S&S Concrete Floors, Inc. has been awarded the 2014 Safety Improvement award from the American Society of Concrete Contractors. The safety award recognizes the company for reducing the rate of lost workday cases for the 2013 construction year ending December 31, 2013. Click on the photo below for a larger view of the certificate.